In 197 more days, all attention turns toward Russia, the hosts of the 2018 FIFA World Cup. A tournament that has already provided surprises and upsets – and it hasn’t even started yet. The 2018 World Cup is going to be extremely different than years before; the United States, the Netherlands, Italy, Ghana and Chile will not be taking part in the World Cup after missing out during qualifying campaigns. Surprise countries are booking their tickets to Russia instead, including Iceland, Peru, Egypt and Denmark. Many eyes will be on the host nation itself. Russia finds itself under an immense amount of pressure by critics surrounding their World Cup bid, and even their own government. With all the pressure, surprises and excitement surrounding the tournament, teams now know their fate, with the World Cup draw taking place on Friday. 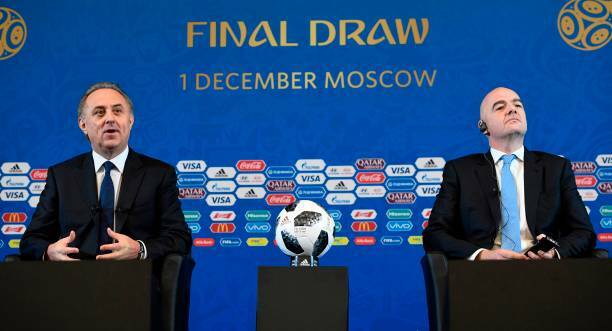 Before the draw commenced, Russian President Vladimir Putin and FIFA President Gianni Infantino spoke. After Putin, Infantino spoke and welcomed various coaches representing their teams to the event. He thanked the Russian people that worked to “get Russia ready” to host the World Cup. After both presidents spoke, the drawing commenced for the teams. The following is the eight groups and how they were drawn. The numbers next to the team names represent their seeding within the group, based on the October 2017 FIFA World Rankings. These help determine the order in which the teams play each other in the group. No teams from the same confederation can be in the same group, except European teams because there are 14 of them. Below each group is my analysis of the teams, and early thoughts on who could come out of each group. Like I mentioned in the introduction, Russia has a lot of eyes on them. Yes, their passion for football is strong, but the wrath about Putin is stronger. However, Russia got lucky in this one. They have a fairly simple group, but teams like Egypt and Saudi Arabia should not be ignored. The biggest task for Russia in this group is Uruguay, without a doubt. However, wins against Egypt and Saudi Arabia are crucial if Russia wants to be on top of their group. Uruguay has had immense success in the World Cup. However, they have a severe disadvantage of not being familiar with Saudi Arabia and Egypt. The last time Uruguay won a FIFA World Cup was in 1950. They’re hungry for another knockout stage victory to prove that being in the tournament isn’t just a fluke. Unless Cristiano Ronaldo manages to break both of his legs, Portugal is going to win this group. Even without Ronaldo, Portugal would probably win the group. Spain is a worthy opponent, but they aren’t the same team they were in 2010. However, with forward David Silva and attacking midfielder Thiago Alcântara, Spain has a large depth of attacking players. On defense, Sergio Ramos and Marc Barta have the ability to shut down Ronaldo. However, all the focus can’t be on him, as Portugal has talented 22-year-old forward André Silva. It’s hard to predict much about Morocco and Iran, with few games being televised or online. However, Morocco has a lot to play for, since it’s their first trip to the World Cup since 1998. Peru had a Cinderella story to get to the World Cup, but it seems to have taken a back seat by looking at Group C. France, who hosted and won the 1998 World Cup, has a large mix of both domestic players, and abroad players making up their national team. Their highlight is Antoine Griezmann, the Atlético Madrid striker. In 49 appearances, Griezmann has scored 19 goals for France, and doesn’t plan on slowing down. Denmark might be the surprise of this group, and they have a solid defense with tall, Danish players Andreas Christensen and Jannik Vestergaard. Australia also had a Cinderella story, wrapped up by the fact that in the same weekend as they punched their ticket to Russia, their country voted on marriage equality. After defeating Honduras in the playoffs to get to Russia, the Aussies confidence is soaring. Iceland is the team you want to root for in the World Cup. This is their first World Cup, and they were welcomed with a drawing with Argentina, one of the power-house soccer nations of the world.However, don’t look at this group and count Iceland out. Alfreð Finnbogason, who features for Bundesliga club Augsburg, is their star striker, recording 11 goals in 45 appearances. Against a team like Argentina, and even Nigeria, goalkeeper Hannes Halldórsson is going to be a busy man. However, he has experience, featuring in 48 matches. It’s not unreasonable to think that Iceland will make it out of the group stage and to the knockout rounds. A draw is what would count as a win for Iceland against Argentina, but matches against Croatia and Nigeria are crucial for Iceland to win. Get your viking chants ready! This would certainly be considered the “mini” Group of Death. Brazil is a power-house, winning the tournament a total of five times in their history. After falling to the Germans by an embarrassing score of 7-1 on their home soil, they want to take a crack at the Germans again – this time with a (hopefully) healthy Neymar Jr. However, they need to advance out of their group first. But will Switzerland, Costa Rica and Serbia prove a challenge to take that No. 1 slot? More than likely not, unless they target Neymar and Dani Alves. Brazil will advance out on top, and potentially even save some starters if their No. 1 spot is clinched. Costa Rica and Switzerland will surely be the two sides to battle it out for the second slot, but Serbia – who is normally known for basketball – will have to rely on their defense. Branislav Ivanović, who captains the side and plays club soccer for Zenit Saint-Petersburg, will be a fan favorite in Russia. He has 100 appearances with the Serbian national team, and has even scored 12 goals. He’ll have his hands full with Switzerland’s Granit Xhaka and Costa Rica’s Johan Venegas. This is the Group of Death, and for good reason. The Mexican Men’s National Team can’t catch a break, and surely Juan Carlos Osorio is feeling the pressure. Drawn against Sweden, a powerful underdog, and 2014 champions Germany, Mexico is going to have their hands full. They were on top of their group in qualifying, but it’s going to take a lot more than just a couple flashy goals from Javier “Chichirito” Hernandez. Carlos Vela will be Mexico’s secret weapon. All eyes will certainly be on Chichirito, but Vela has just as much goal-scoring power as he does. The first signing for Los Angeles FC will make his name known in Russia. However, it’s hard to bet against Germany winning their group. Head coach Joachim Low has the luxury of depth, yet this might be the first World Cup that fans don’t see Manuel Neuer and Thomas Muller. Germany has had star players rise through Lars Stindl and Timo Werner, who both have 10 appearances each. Werner already has seven goals, while Stindl has four. Also, Germany won the 2017 FIFA Confederations Cup. They have experience playing in Russia, and they’ll use it to their advantage. The last two groups were a tension breather for a minute. Belgium’s not-so-secret weapon are the Hazard brothers: Eden and Thorgan. In Brazil, the Belgians made the quarterfinals, before eventually finishing in sixth place. Only five spots away from lifting the World Cup, the Belgians are on the attack, ready to take the short flight to Russia. Romelu Lukaku has been having a roster-worthy season for Manchester United, scoring eight goals in 14 matches. Pairing him and Eden Hazard together would be, well, a hazard for opposing teams. Don’t count the Lions out, though, and Panama either. Panama made the United States’ life miserable, and took their qualifying spot right from under them. Panama has a talented group of attackers, including Blas Pérez and Aníbal Godoy. Meanwhile, England will be led by star attacker Harry Kane and midfielder Alex Oxlade-Chamberlain. It’s hard to bet against Robert Lewandowski. The Bayern Munich man is a goal-scoring machine, already putting 13 balls past opposing goalkeepers in the Bundesliga season. He’ll be leading Poland in the World Cup, which is their first since 2006. Poland’s real test will be Colombia, who have a knack for bringing young players to the tournament. In the recent call up, there were only six players over the age of 30. Colombia, Senegal, and Japan are no dummies to how good Lewandowski is, and they’ll make a game plan to tie him up. Manager Adam Nawałka will have to select different players to either bring attention away from Lewandowski, or to start scoring goals themselves. Well, now the teams are set and know their first opponents. There’ll be much talk about a “Group of Death,” “Group of Life,” favorites and underdogs. However, all of this is talk is really moot. Since the players and teams settle it out on the pitch from June 14-July 15 2018. The final team standing is crowned World Cup Champion.